Another name is General Tyree Harris Bell, a veteran Confederate general who farmed in Sanger and Clovis. He is buried at the Bethel Cemetery on East Central Avenue near Indianola Avenue, south of Sanger. These veterans were not all military officer, as was General Bell, but they were pioneers in this area who contributed to the early growth of farms and businesses. This year there is a particularly different and first-time-ever memorial event. It will be at Mountain View cemetery on our National Memorial Day, Monday May 27, 2013. 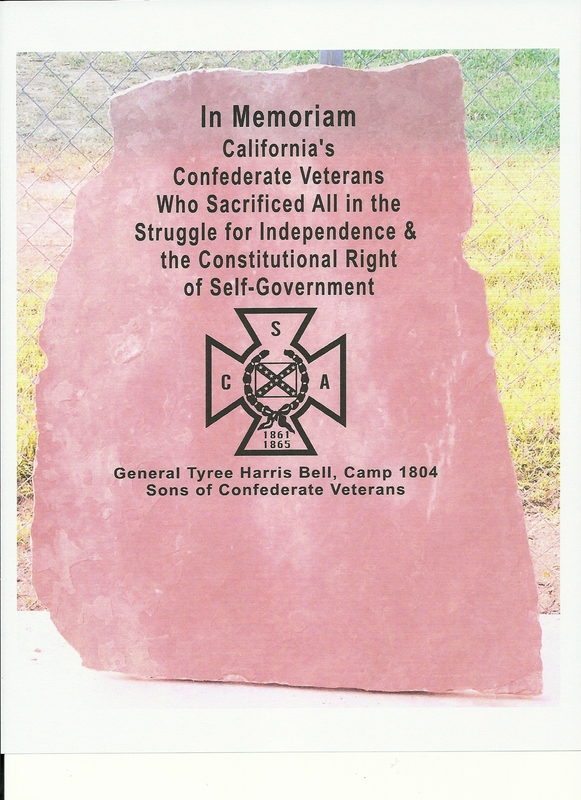 It is an event to recognize both Union Veterans and Confederate Veterans who came to California. There are over two-thousand, and many are buried in the San Joaquin Valley and in Fresno County. The marker being placed at Mountain View Cemetery is a double sided block with a Union stone on one side and a Confederate stone on the opposite side. 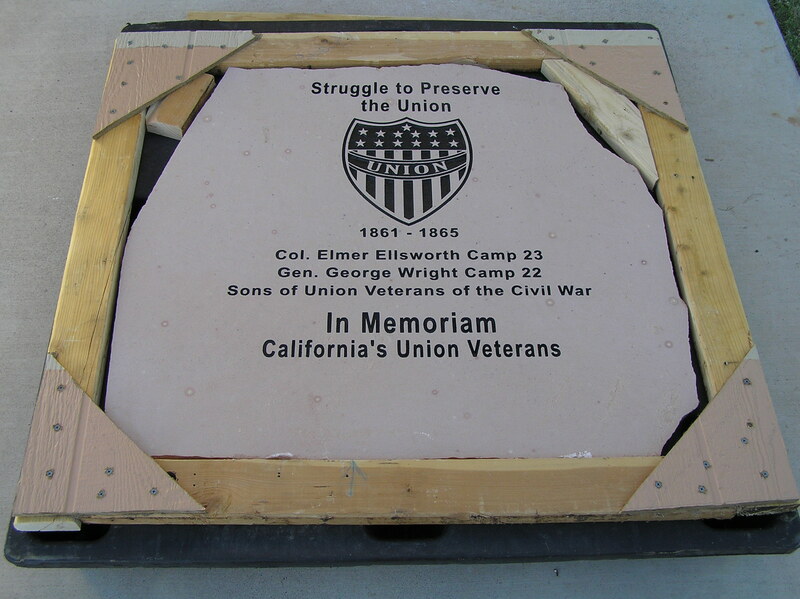 The Sons of Union Veterans organizations in California are providing the Union stone. The Confederate stone has been provided by the Sons of Confederate Veterans local General Tyree Harris Bell Camp 1804. General Bell is buried at Bethel Cemetery in Sanger. This memorial being placed is in the center of California. No other veterans memorial marker has both Union and Confederate memorials on it. No other memorial event is a reconciliation event of the north and the south. This one is. No other event has honored both Union and Confederates. It is an event of importance because Memorial Day was born out of the Civil War. And this year is the mid-year of the 150th Anniversary of 1863 – the middle year of the war. All are invited. It will be a memorable pageant of honor. Red, white, and blue flags will unfurl in a warm breeze. The words of speakers will be carried softly. Period music, that is old melodies, will move us as flowers are laid for each state. Salutes will jar us, and “taps” will quiet us. Most important are the men being honored. They have thousands of deceased descendants, thousands of families, thousands of living descendants living in Madera, Fresno, the valley, and elsewhere. Many of you have connected with your past ancestors through the Madera or other Genealogical Society. Many new connections await your new searches. For further information on this event, you may contact Chuck Norred at email: chucknorred@comcast.net and phone: 559-706-1565. Chuck is the commander of SCV Camp 1804. This entry was posted in Uncategorized and tagged ancestors, California, descendants, history, Honor, Memorial Day, memorials, Remembrance, Veterans by timdesmondblog. Bookmark the permalink.